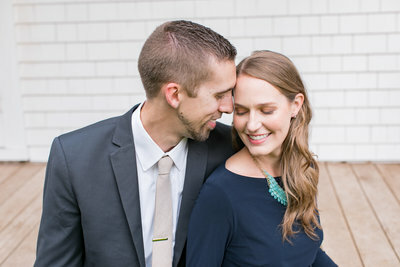 When we talked about location options for their engagement session, Amy and Andrew chose the popular Downtown Huntsville. It tells a piece of their own story, so it was a perfect choice! Amy wanted to incorporate as many of the gorgeous spring blooms into their session that we could. And blooms we did find! Flowering trees lined the quiet streets of some of our favorite historic neighborhoods downtown. Dogwood trees, redbuds, and snowball trees gave us the spring florals we dreamed of. Pair that with a golden evening and a fun couple – we couldn’t ask for anything more! One of my very favorite memories from Amy and Andrew’s engagement session was when they told us about the Lucky Duck Scavenger Hunt. You can get a map from the visitor’s center that gives clues to 14 bronze ducks hidden around downtown. Who knew?! It was under one of these ducks that Amy and Andrew decided they were meant to be. We stopped and took a few pictures in that exact same place…on the exact 2 year anniversary of that moment. Ahhh! I love that so much. Enjoy a few peeks at Amy and Andrew’s gorgeous spring blooms engagement session in downtown Huntsville! How many times have we been here and never looked up to see the hidden duck? I love so much that this little guy is part of Amy and Andrew’s story! Want more downtown Huntsville engagement session inspiration filled with beautiful blooms? You’ll love Christina & Eric’s downtown engagement session! What gorgeous photos!! And such a wonderful story about the ducks! These pictures are gorgeous! Such a beautiful couple inside and out! Wow! Such a beautiful story and couple! Thank you so so much, Joel and Amber! These pictures are amazing and we will cherish them forever! Downtown Huntsville is a wonderful place for pictures! So happy for this great couple! These are gorgeous! I love them all!! Stunning!! So happy for you, Andrew! These photos make my heart smile! Love this gorgeous couple so much and so incredibly happy for them! Beautiful couple inside and out! The pictures are beautiful! I’m so happy for you guys! Can’t pick my favorite – they are all fantastic! Love you both! My sister looks so beautiful! Beautiful photos. Couple is definitely belong together. Y’all are precious. Those snazzy outfits suit y’all. Love the photos and the setting. Joel and Amber did a fantastic job with you both. Beautiful photos. Love the duck story. Proud dad. So pretty!!! Happy for you guys! Stunning photos Amy! Best of luck! These are amazing! I love the ring on flowers, and how perfect the timing is. Well done, and congrats to Amy and Andrew! In love with the hair clip!!! Can’t wait to celebrate with y’all! Straight out of a fairy tale, like a nymph and her knight. Very picturesque! Beautiful pictures! So happy for both of you!